Our illuminated, rotary, shaft encoders when used with our various translucent knobs, can enhance the appearance of many kinds of electronic product. Horizontal or vertical PCB mounting. Standard shaft 6mm knurled / 18T. With or without indent (click). With or without push switch (momentary). Single colour,color, horizontal type without switch. Single colour,color, vertical type without switch. Dual colour,color, horizontal type with switch. Multi colour,color, vertical type with switch. Non standard LED colours colors are available, subject to minimum lot quantities. 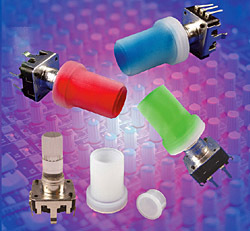 CL170976 Knob K85 translucent 6mm SPL. CL1709762 Translucent cap with black marker line. Other cap colours colors are available, either plain or with a marker line. Contact Rating: 0.5mA 5V DC. Dielectric Strength: 300V AC / 1mA, 1 minute. Insulation Resistance: 100MΩ at 250V AC. Operating Speed (maximum): 60 RPM. Switch Power Rating: (where fitted) 5V DC 10mA. Encoders and Knobs (opens in a new window). Encoders and Knobs - specifications (opens in a new window).